The winners of the 2016 award were announced at the SC16 Awards Ceremony on Thursday, November 17, 2016. 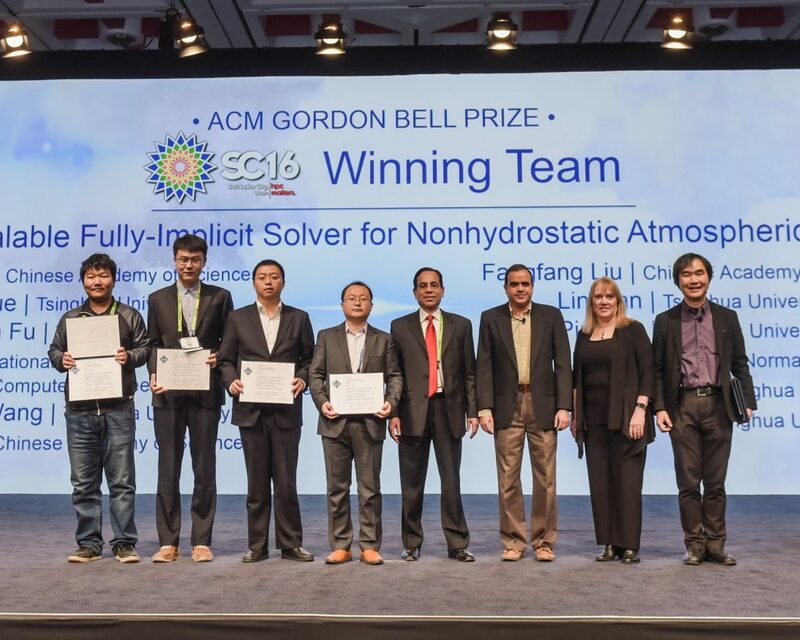 The 2016 ACM Gordon Bell Prize was awarded to a 12-member Chinese team for their research project, “10M-Core Scalable Fully-Implicit Solver for Nonhydrostatic Atmospheric Dynamics.” The winning team presented a solver (method for calculating) atmospheric dynamics. Winning team members are Chao Yang, Chinese Academy of Sciences; Wei Xue, Haohuan Fu, Lin Gan,Ping Xu, Guangwen Yang, and Weimin Zheng, Tsinghua University; Hongtao You, National Research Center of Parallel Computer Engineering and Technology; Xinliang Wang and Lanning Wang, Beijing Normal University; and Yulong Ao and Fangfang Liu, Chinese Academy of Sciences.